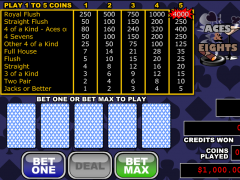 Aces and Eights is an exciting game of draw poker. The player is given five cards by the dealer and he or she chooses which cards to keep or hold. The player then discards the remaining cards for new ones. You will receive the cards automatically from the dealer nut when replacing for new ones, you will have to press the deal button. The final hand is said to be a winning hand if the player has a pair of jacks or better. There is also a special payout in this game if the player has four eights, aces or sevens. You should also note that playing more coins will increase the amount you are paid on winning hands. For the four aces, eights and sevens, there is a special payline for them. The rules of this game are very clear and easy to understand. One, you should know that the hands are graded on the pay table, cards are dealt from a single deck, cards are reshuffled after every hand and the player has the option to discard up to 5 cards. These are the basic rules that differentiate the Aces and Eights game from other card games and it is important each and every one of them be put into consideration if you aim at playing this game. The hands are always ranked in order of: pair of jacks or higher, 2 pair, 3 pair of a kind, straight, flush, and full house, 4 of a kind, straight flush and Royal flush. The player could emerge a winner if the final hand is a least a pair of jacks and similarly, the player could lose if the final hand does not meet the minimum hand of at least a pair of jacks. To start playing this unique game, you have to place a bet in the first place. Do this by purchasing credits by clicking on chips to put into the game. You could then opt to bet from one to five coins and the higher you bet the more you increase the payout for a winning hand. You will then click ‘bet one’ for you to bet one coin. You could increase the bet by clicking it again until it is at a maximum of five coins. On the contrary, you could click ‘max bet’ so as to go straight to the highest bet, 5 coins, instead of manually increasing it from the ‘bet one’ button. For you to deal the cards after you are satisfied with your bet, click draw deal, and this could also be used to deal cards after the cards have been selected to be held. The game then commences with you playing to your best of experience so that you could attain a better hand. This game is not for the novices although they could easily learn and participate. For you to win, you will require experience and exposure to the game. For the single hand video poker, which has just one hand, it could be played from as low as 0.05 coins to a max of 5 coins. You could use the payable button to view the payout table and the proper column will be highlighted based on the number of coins played. Single credits can be inserted into the poker machinery clicking the coin slot in the bottom right corner. For the multihand video poker game, there are three or more hands that could be played from as low as 0.01 to 1.0 dollars. Here players could choose from 3 hands, 52 hands or 100 hands. Click the pay table button to check the payout table. In each of the hands played by the player, all cards he or she is holding appear and more cards are drawn randomly to replace the discarded ones. If a player discards a card, it cannot appear again in any of the subsequent hands. Video poker is creatively entertaining and involving so as keeping the player busy and glued to the game.